We take to the pavement, launching across the Valle Santa Clara towards the serrated edges of mountains on the horizon, dusk grows deep and purple as the Varaderos return to what they do best; long stretches of pavement, frequent pulls of the throttle and v-twin torque-laden passes. We roll into the military checkpoint at the junction of Mex 3 and Mex 5 as night falls, and our hopes of a daylight arrival into San Filipe are quelled. The two 996cc twins heterodyning, the road parallels Salinas Ometepec as southbound we close on the shoreline that angles towards us. 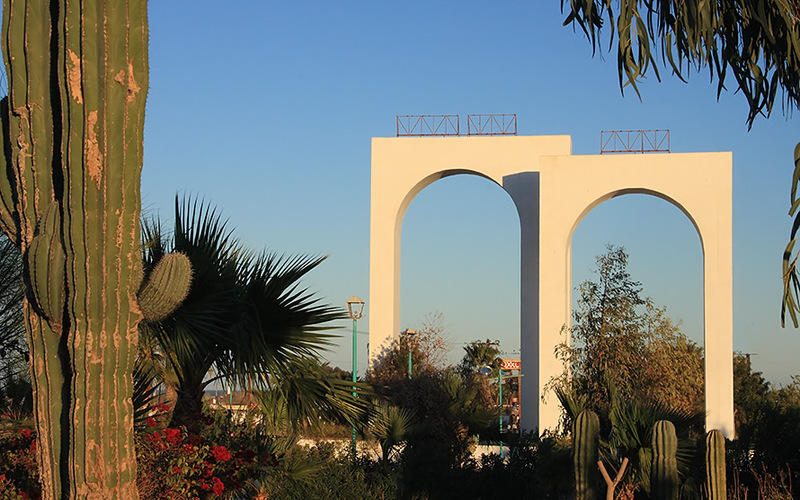 The completion of this road in 1951 connected San Filipe to Mexicali, and transformed a town founded by Dominicans in 1797 as a supply depot into a tourist destination. 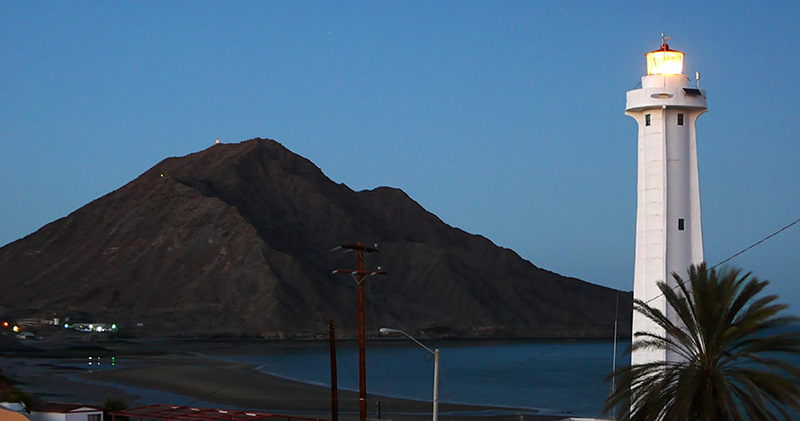 Yet, pulling into San Felipe, it’s instantly obvious the town has escaped tourism despoilment. 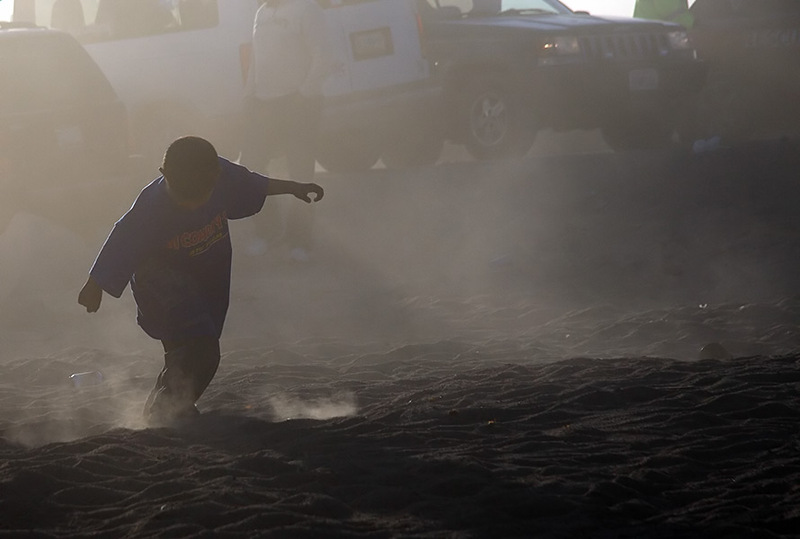 The main roads and Malecon are paved, but as many are hardpack and sand, leading Kevin to dub it “Sand” Filipe. 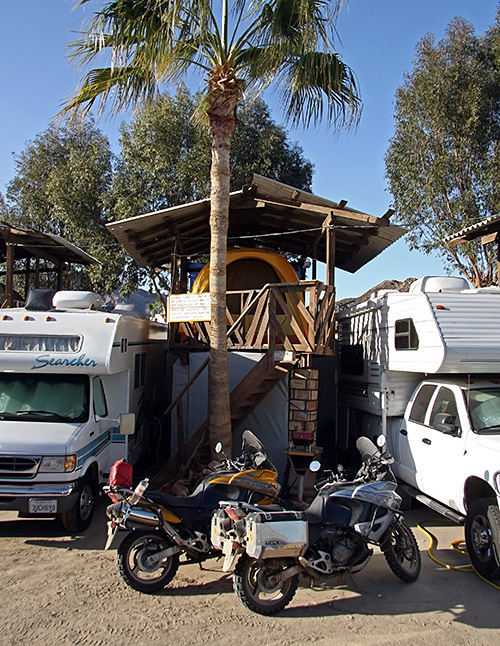 The expatriate population of Canadians and Americans is strong, but equally passionate about keeping San Filipe a small Baja town and around the campfire at Kiki’s you can starting-gun fire a debate by asking if the four-lane upgrade to Mex 5 is a good thing for the town. Provided the bellowing Country and Western drone of the Cowboy Paul show doesn’t attempt to drown out the conversation. Campo politics are quickly revealed as this interloper interrupts the scheduled conversation time around the nightly fire. Kiki’s on the Beach though is hugely welcoming. Kiki himself is an avid rider and ex-racer, who takes the time to pour over maps with us, pointing out which roads will be passable on the Varaderos and which will be too challenging. 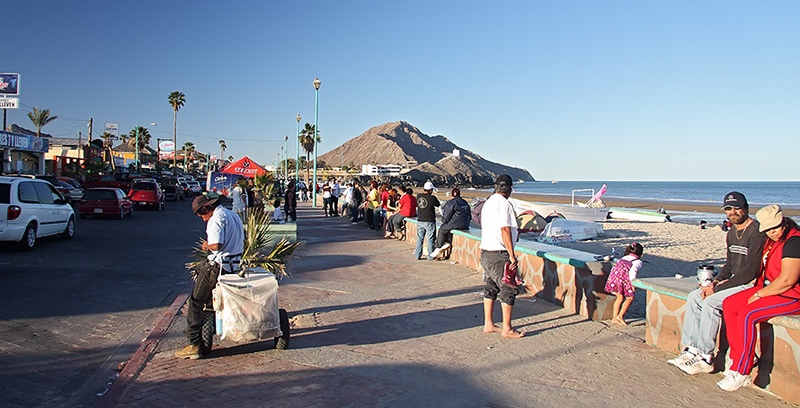 And Ron, the “Mayor of San Felipe” (he knows everyone in town it seems), and Patty, the Matriarch of the camp, help us run around town, hunting down an inner tube (in case we suffer another bent rim), a cargo net, a spare gas can, and the all-important apple fritters from the local bakery. These are good souls, founts of local knowledge and I nickname them with the utmost respect. 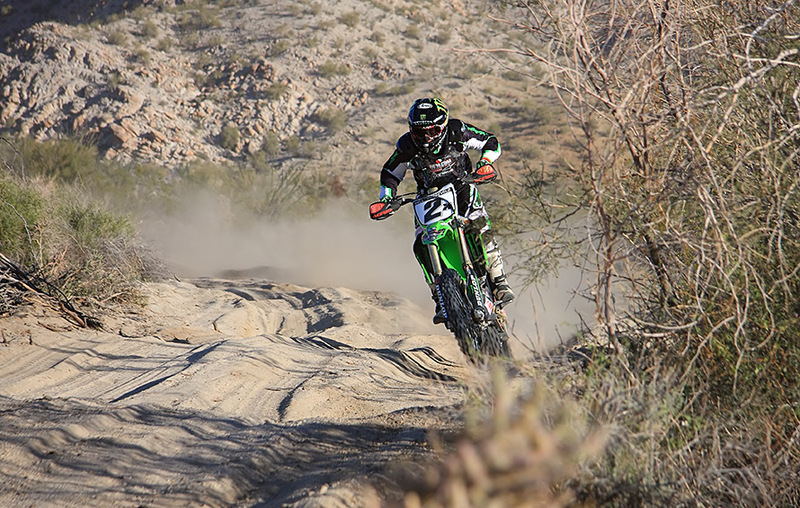 They are also fans of the “local” races, the upcoming Baja 250 (March 13th, 2010 weekend), which starts and ends in town. Coursing through San Filipe is a lifeblood of motorsport; the race fills the town bringing thousands of riders, support crew and spectators who infuse the local economy with off-season dollars. We check our calendar, make calls, and extend our trip. 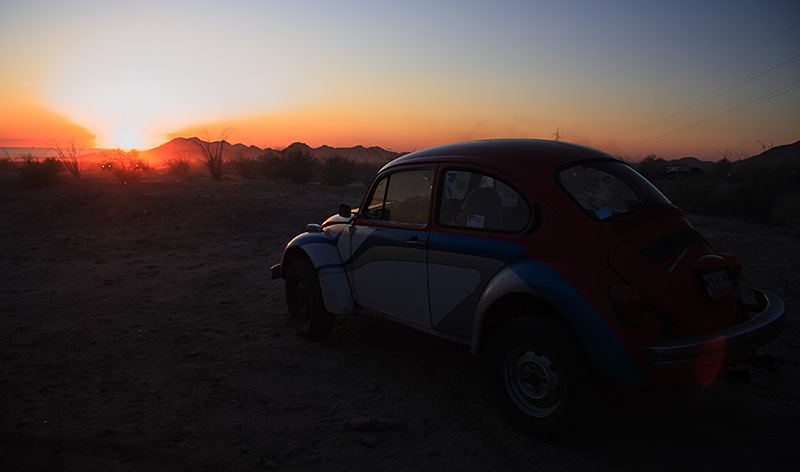 We’ll be returning to San Felipe for the Baja 250. 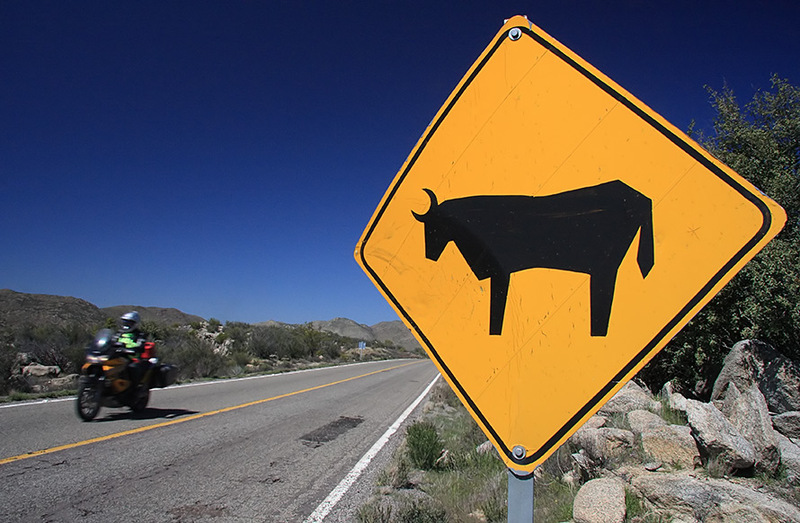 There is a culture of dirt and adventure riding here, and we no sooner park the Varaderos than a Canadian or American dualsport rider, ex-racer, V-Strom pilot or adventure dreamer comes along to ask about them. Inadvertently, by opening our hotel room door on our final night, we become the Honda Varadero information kiosk. Through a history of racing, Honda has developed a proven record in Baja, and amongst those retired expats and aging Baja riders there’s more excitement over a Honda Adventure bike that we’d ever have expected. Enough interest that I’m forced to give up on writing, make some quick notes, and join our fellow expats outside, talking bikes, motorsports, travel and highways under a sky shot through with crystal stars. 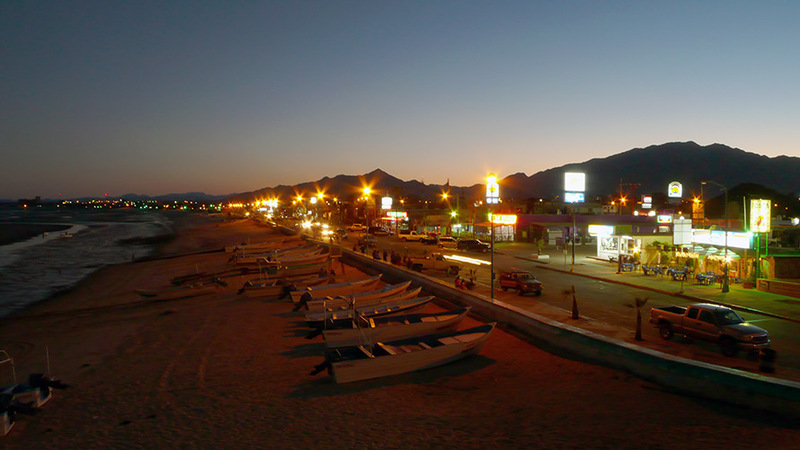 San Filipe is growing, but the highway to Mexicali isn’t quite complete and the economic downturn and overwrought American newscasts of drug violence in the Baja has slowed development substantially. 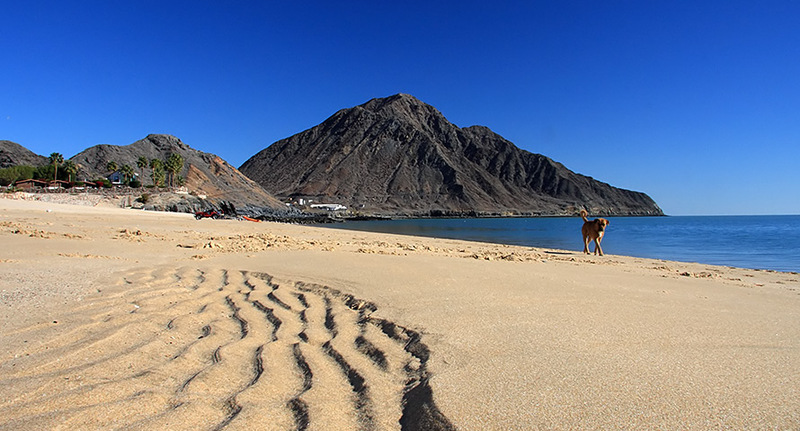 With it comes time for the two populations here, the norteamericanos and locals, to navigate what that growth means, and keep San Filipe the quiet, calm, motorsport junkie perfection that it is.